Plug in the Finger Print reader into any USB port. 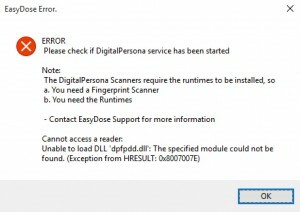 Go to Maintenance menu and select Digital Persona FingerPrint Reader. 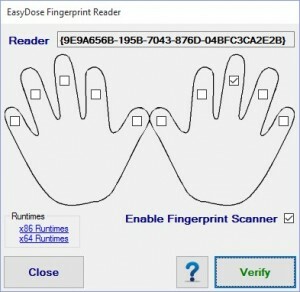 If an error is displayed, then the required software has not been installed to run a Finger print reader with EasyDose. For this next step you MUST know (accurately) whether your Windows operating system is a 32 bit or 64 bit operating system. (Computer > Properties). Click OK to clear the message. 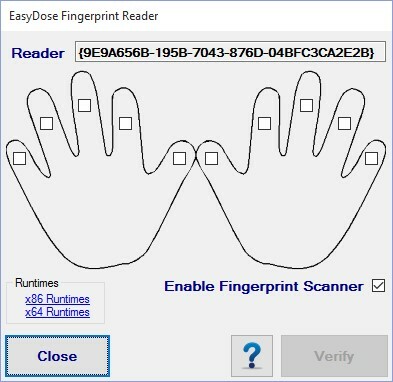 The EasyDose Finger Print Reader form will open. 64 bit – select x64 Runtime. Click on the Appropriate Link under Runtimes. Your chosen Web Browser will open and download the selected Runtime file. The file will be a .zip file. Open the zipped folder and run the Setup.exe file. 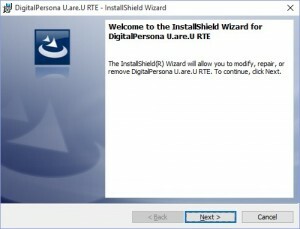 Follow the onscreen installation instructions. After closing the Installation Form, you will need to Restart your computer. 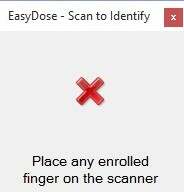 After the computer has restarted, reopen EasyDose. 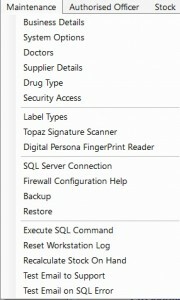 Again, go to Maintenance menu and select Digital Persona FingerPrint Reader and note the Reader Number has now been inserted at the top of the form. 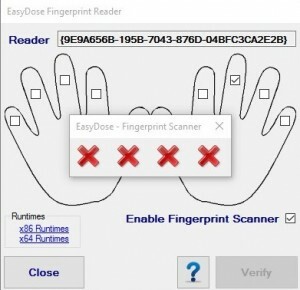 Enable the Finger Print Scanner by Placing a tick in the box. Place a tick in the box n the required finger and a scan verification window will open. There will be four rex crosses displayed. 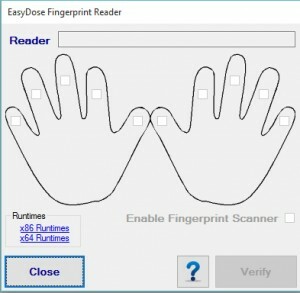 Test the scanner by selecting a finger in the form (tick in box) and scan that finger 4 times. If successful, four green ticks will appear, that form will close and the verify Button will be enabled. The above form will close automatically when successful scanning is complete. The Verify Button will now be enabled. Click to Verify the four scans and the following form will open. 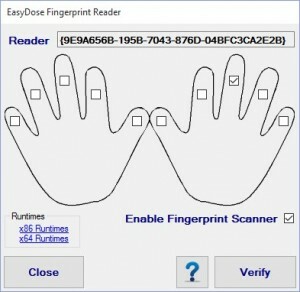 Place that same finger on the reader to verify. Successful verification will result in the text on the verify button turning green.